Thanksgiving leftovers have never been so appealing. 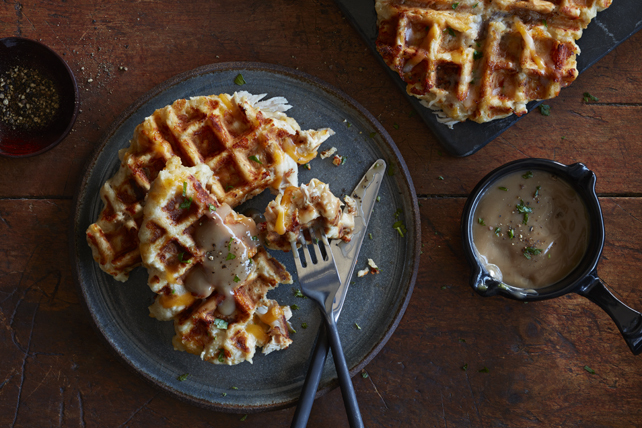 These crisp but fluffy waffles are stuffed with leftover roasted turkey and cheddar cheese, then served topped with hot gravy for this fun dinnertime take on a favourite breakfast food. Spray electric waffle iron with cooking spray. Heat iron to medium heat. Combine first 6 ingredients in large bowl. Whisk egg, milk, yogurt and butter until blended. Add to flour mixture; stir just until blended. (Do not overmix.) Stir in turkey. Serve waffles topped with gravy. Place waffles in covered pan in 250ºF oven to keep warm until ready to serve.